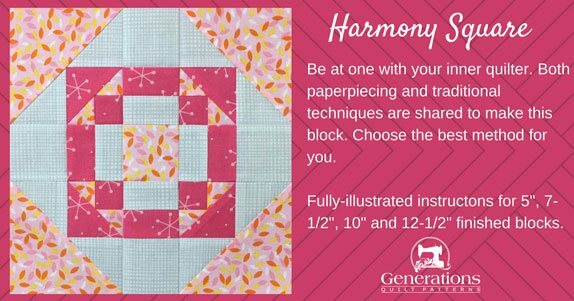 Be at peace with your inner quilter while stitching up the Harmony Square quilt block. 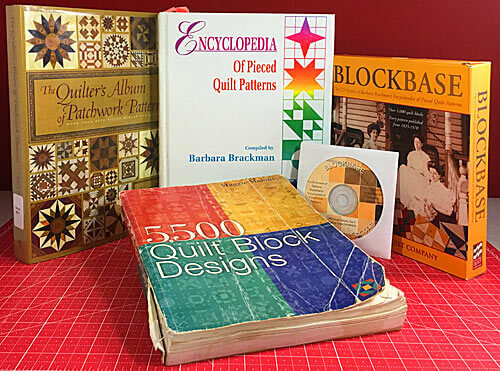 Both paperpiecing and traditional piecing techniques are presented. Choose the method that works best for you. Step-by-step illustrated instructions for both methods—choose your favorite! When instructed to press, first press the patches in the closed position just as they came off your sewing machine. This sets the seam, melding the thread into the fibers of the fabric. In paperpiecing, SA are always pressed towards the last added patch. 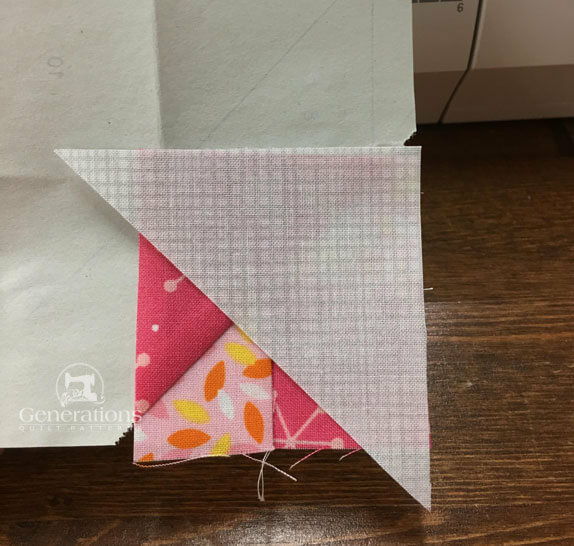 If you prefer traditional piecing methods, omit this printing and skip to Step 1. Use the green cutting chart. 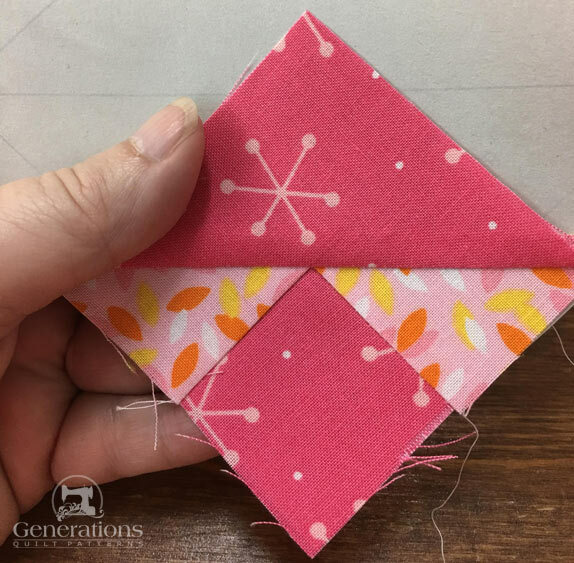 Follow the traditional piecing instructions in Step 2 for the corner units. 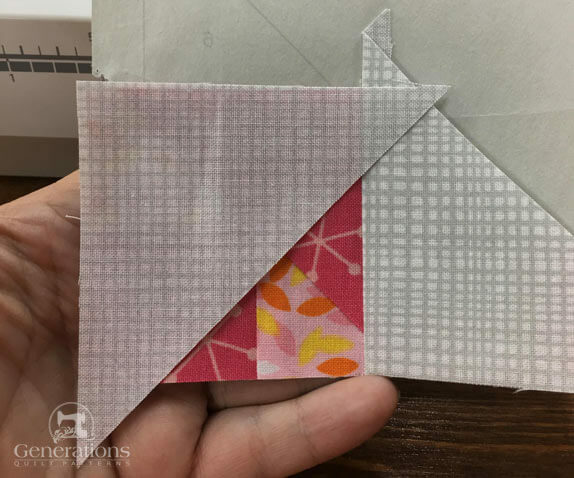 For all you paperpiecers, follow the instructions below to download and print the patterns used to complete this block. Choose your Finished Block Size from the chart below and print the corresponding number of pages for a total of four units. 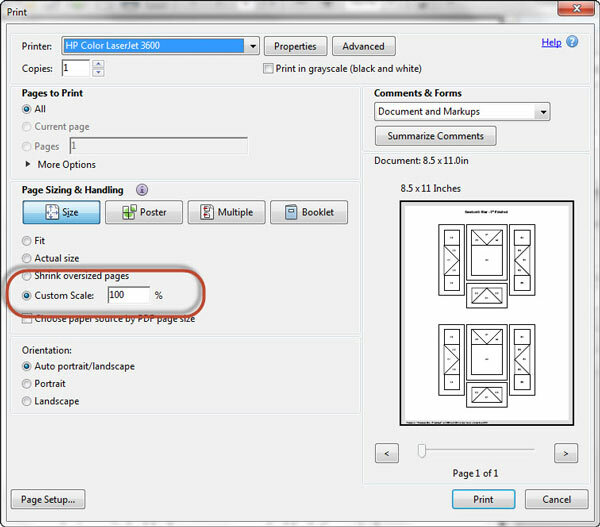 After printing, use the 1" square graphic on the printed page(s) to check that the patterns printed correctly. A light, a medium and a dark fabric are needed to complete this patchwork design. 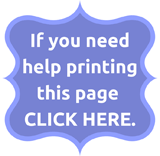 To print a copy of just the block design above and cutting charts below to use at your cutting table, click here. 2,3	 Med 4	 1⅞"	x	1⅞"	 2⅛"	x	2⅛"	 2⅜"	x	2⅜"	 2⅝"	x	2⅝"
4	 Dark	 2	 2⅜"	x	2⅜"	 2⅞"	x	2⅞"	 3⅜"	x	3⅜"	 3⅞"	x	3⅞"
5, 6	 Light	 4	 2⅜"	x	2⅜"	 2⅞"	x	2⅞"	 3⅜"	x	3⅜"	 3⅞"	x	3⅞"
7	 Med	 2	 3⅜"	x	3⅜"	 4⅜"	x	4⅜"	 5⅜"	x	5⅜"	 6⅜"	x	6⅜"
2, 3	 Med 4	 1⅜"	x	1⅜"	 1⅝"	x	1⅝"	 1⅞"	x	1⅞"	 2⅛"	x	2⅛"
4	 Dark	 2	 1⅞"	x	1⅞"	 2⅜"	x	2⅜"	 2⅞"	x	2⅞"	 3⅜"	x	3⅜"
5, 6	 Light	 4	 1⅞"	x	1⅞"	 2⅜"	x	2⅜"	 2⅞"	x	2⅞"	 3⅜"	x	3⅜"
7	 Med	 2	 2⅞"	x	2⅞"	 3⅞"	x	3⅞"	 4⅞"	x	4⅞"	 5⅞"	x	5⅞"
Grid Size	 ½"	 ¾"	 1"	 1¼"
In our sample Harmony Square this unit is paperpieced. 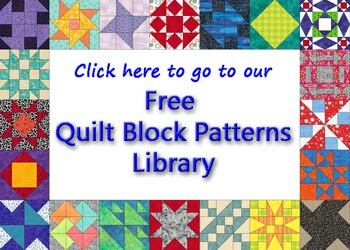 However, I realize that not everyone cares for that technique, so you can choose traditional piecing instructions instead. For those instructions, click here. Otherwise, for all you paperpiecers continue here. Reduce your stitch length to 15-20 stitches per inch. This perforates the paper and provides stability to the seam as you remove it. Use a larger needle (90/14) if you have problems removing the paper. After adding each patch, press the unit as it came off the sewing machine to set the seam. Then press it open. It is automatically pressed towards the last patch added. Steam is optional and usually curls the paper. If that bothers you, don't use steam. 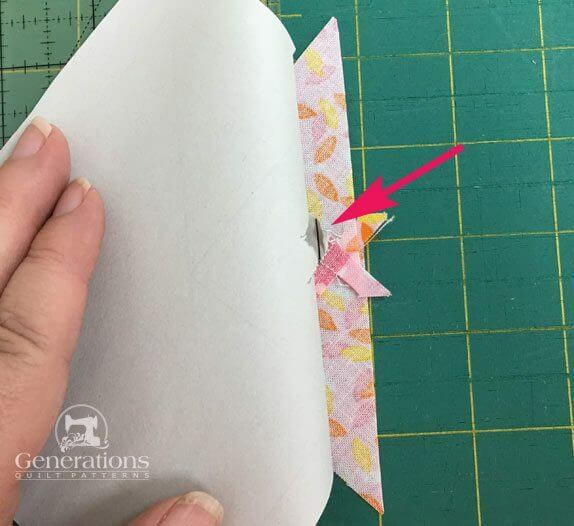 Trim away the excess paper from each unit just outside the dashed lines. There's no benefit to being neat, a rough trim will do here. Using the tiniest dab of Elmer's Washable Glue stick stick the wrong side of a #1 to the unprinted side of the pattern. Use the dashed placement guides for fast and accurate positioning. That was quick and easy to position! With RST align the short side of a #2 with the #1. Stitch on the solid line between #1 and #2 starting and stopping a generous 1/4" from the beginning and ending of the line. Each line you stitch is stitched in this same manner to insure secure seams. Repeat this same process for #3. That long straggly thread tail peaking out from the printed side will get trimmed away. Time to trim the SA of #2 and #3. At the cutting mat, lay the unit printing up. 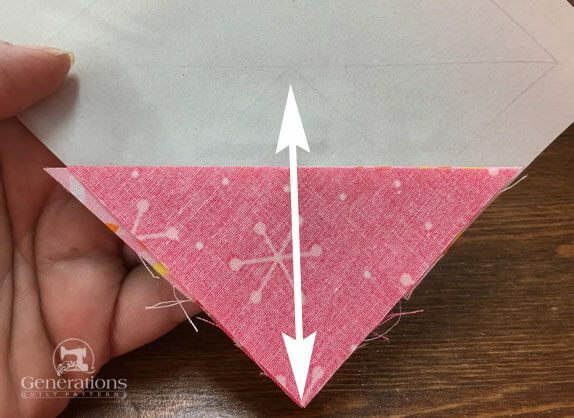 You'll need to pull the fabric away from the pattern a little...it will tear a bit (pink arrow). That's normal. Align the edge of your ruler with the solid line between #2/#3 and #4. Use your thumbnail to crease the paper on the solid line. 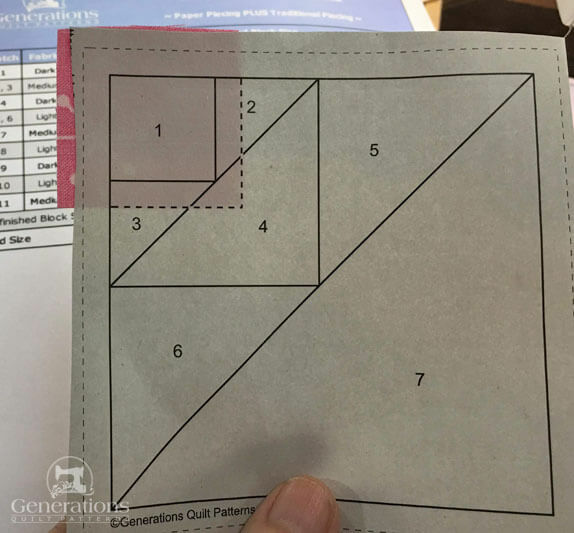 Remove the ruler and fold the pattern back on itself on this line. 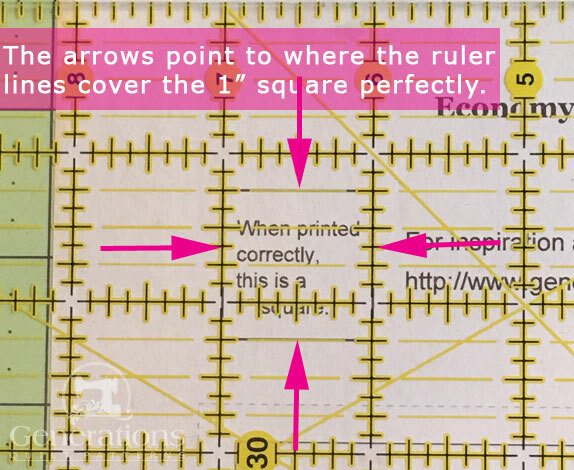 Position the ruler with its 1/4" marks (pink arrow below) on the fold of the pattern and trim away the excess fabric. 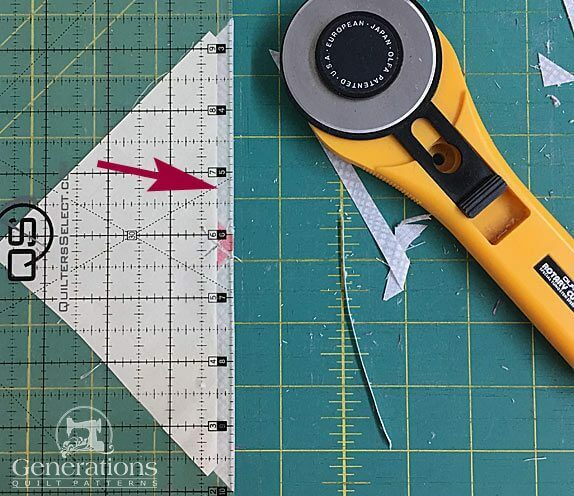 Some quilters find this job easier with an Add-A-Quarter PLUS Ruler. 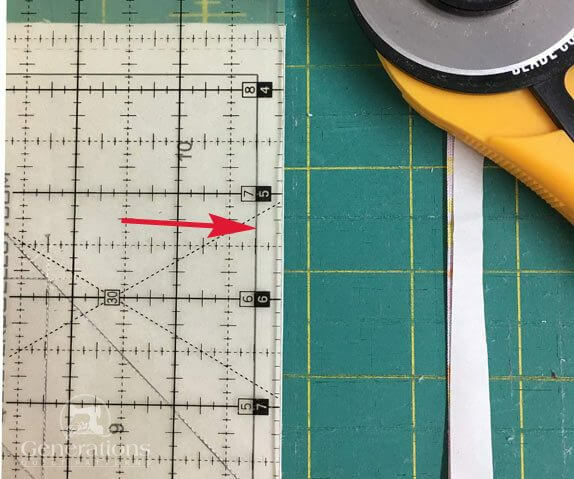 Use this same technique every time you need to trim a seam while piecing this corner unit. 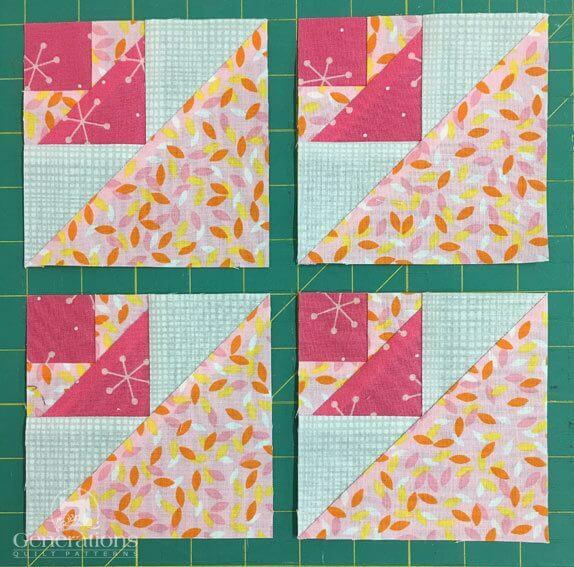 With RST, align the long bias edge of #4 with the trimmed #2/#3 edges. For quick placement, the point of the #4 patch should be opposite the point on the pattern (white arrows). You can just barely make out the printing on the other side of the pattern. Stitch the seam. Since it runs from edge-to-edge, you can chain piece this step. 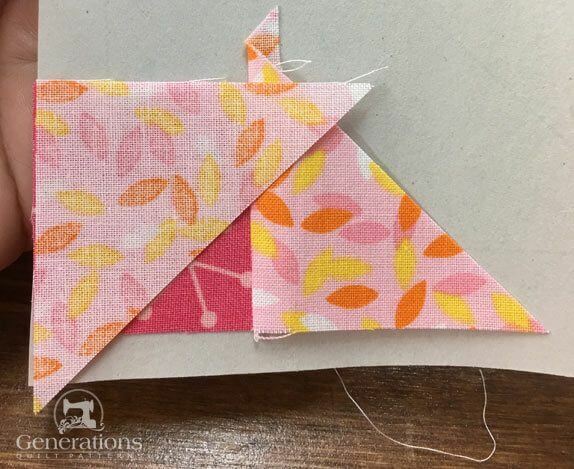 Our Harmony Square quilt block is coming along nicely! Trim the seam allowance as you did before for #2/#3 for both unstitched sides of #4. After trimming, with RST position the short side of a #5 with the edge of #4. Trim the #5/#6 SA as you did before. 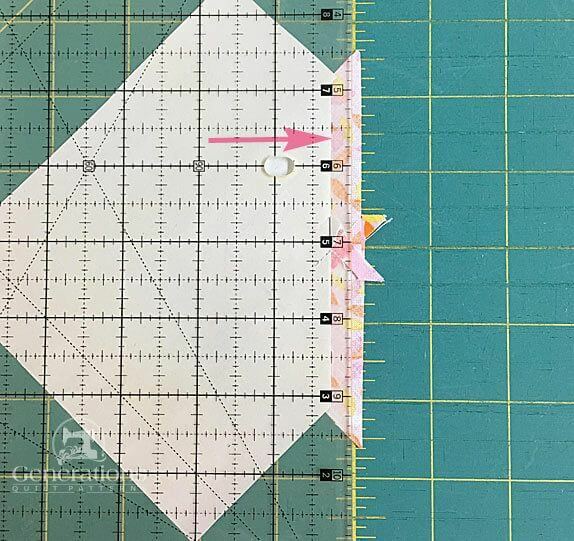 The 1/4" line on your ruler is right on top of the folded edge of the pattern(pink arrow). With RST align the long bias edge of #7 with the freshly trimmed edges of #5/#6. Position the point opposite the corner of the pattern. All that's left is do is trim the unit to size. 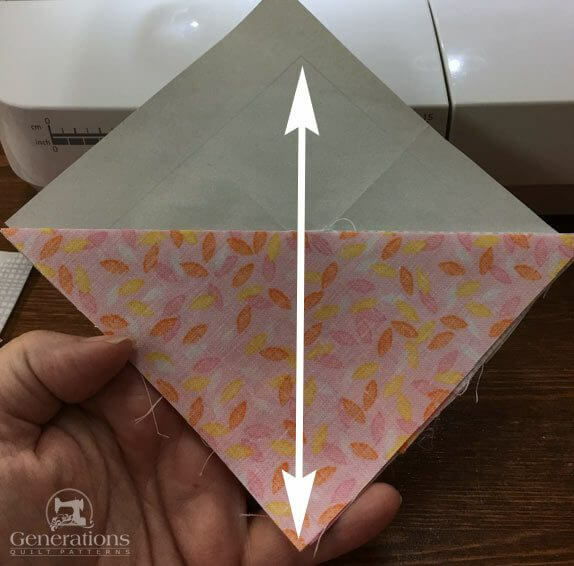 At your cutting mat, paper side up, place the 1/4" mark on your ruler directly on the solid outside line of the pieced corner unit. Trim the excess away with your rotary cutter. Repeat for all four sides of all four units. This is what they look like after all is said and done. 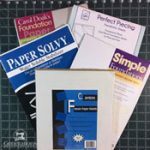 Don't forget to remove the paper from your Harmony Square corner units. 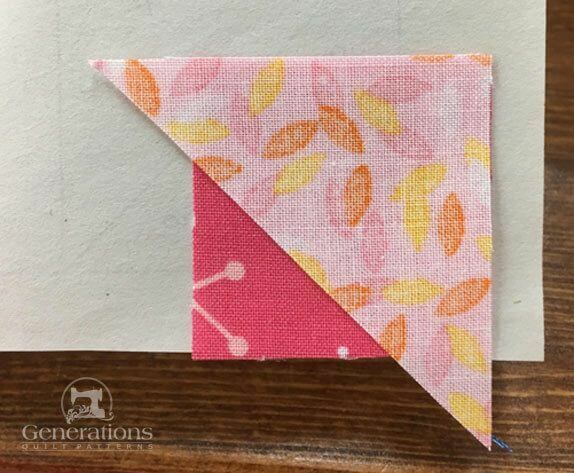 ...click here to see how the Corners are pieced using traditional methods.